Many years ago, I used to make beaded earrings. I finally decided to give it another try and have really been enjoying it—when I can take some time off from sewing birds. 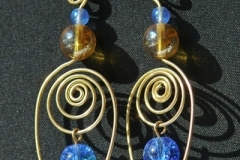 These are made with non-tarnishing silver- and gold-plated wire. The earring wires are nickel-free.